Welcome to my Trip Report on Sriwijaya Air! Are you sure you are my flying partner, Sriwijaya? Please read on to find out! Flying on this airline was certainly on my agenda. Since I was flying the CRJ1000 to Surabaya from Denpasar, I would then decide which airline would take me to Jakarta. 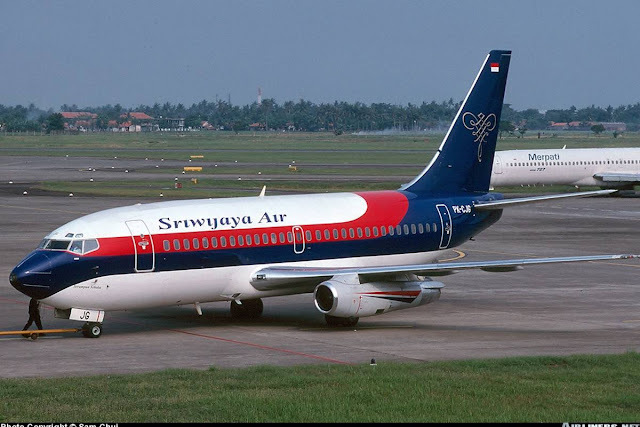 My original plan was to fly back to Denpasar with Sky Aviation SSJ but the timing didn't match so looking out at Sriwijaya's website, there were a few flights instead to Jakarta with suitable timing. I did some homework on the aircraft type and only the SJ267 interest me. This flight was to be operated by Boeing 737-500 which I am still short of in my flight logbook. 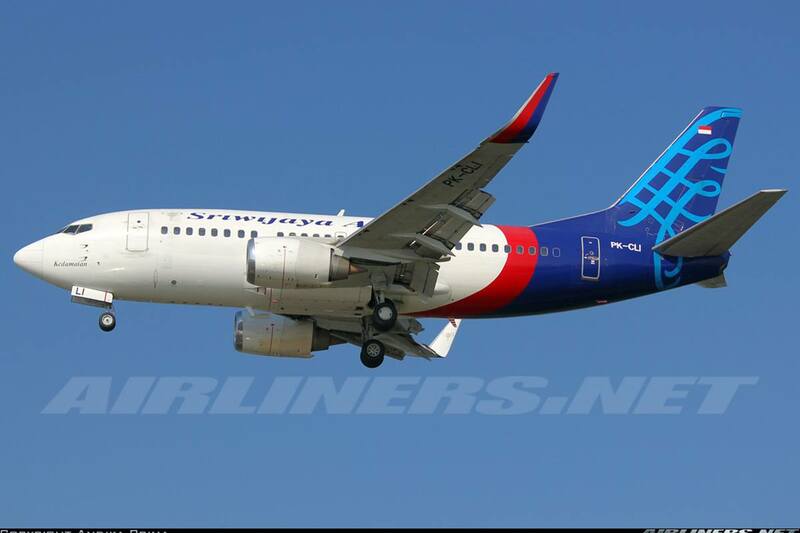 Sriwijaya has winglets on the 737-500 and that is certainly a bonus! Booking with this airline is easy. The website may be basic but its working fine. It comes in 2 languages, Indonesian Malay and English. However, you can't choose your seats and also do online check-in which means you have to go down early to do so. Inconvenient but that is how this airline works. The air fares is pretty reasonable and I paid around S$60 for Surabaya to Jakarta one way. This email itinerary took a while before it arrived to my mailbox. I was a little bit worried at first but after half an hour or so, I received it so that's confirmed. On the day itself, I reached Surabaya at 10.40 with Garuda's CRJ1000, that flight was superb. Check out my trip report on it. I was just glad that I didn't travel a few days ago because the airport back then was closed due to the huge amount of volcano ash landed at the airport, stopping the airport operation. Fortunately, the volcano didn't erupt again and the airport was opened 2 days before my flight there. Thank God! If my Garuda and Sriwijaya flights were cancelled, I wouldn't know what to do then! Anyway, once I was there I explored both terminals, here are the photos! Not many shops at the air side, should have spent some time over there taking some photos since I wasn't going to depart from this terminal, perhaps next time. Looks comparable to Terminal 3 of CGK airport. Which do I prefer? Its a tough call really. Anyway, since there wasn't much to do over there, I decided to spent some time at the Starbucks to catch up some work. There is free wifi at this airport but at the Starbucks, I had some problems with the connection. After finishing my work, I decided to head down to the terminal 1. There is a free shuttle service at lane 2 outside the arrival hall. The Terminal 1 and 2 are so far apart from one another! About 2.5km to be exact, no way you can go there unless you have your own transport. Inconvenient if you ask me and luckily my flight wasn't 1 hour apart otherwise I would have possibly miss it. The bus ride took about 30 minutes and when I reached there, I felt that time had gone back in the 80s/90s. The terminal 1 looks very old and it could certainly do with a facelift or something! Here are some photos of the interior. The check-in departure area. Just like other Indonesia Airport, you have to show your itinerary to an officer before being allowed to enter the check-in area. The departure hall, the amazing thing is there was free wifi at the gates, basically everywhere! This is something Changi Airport should learn. You want to offer free wifi? Have the router installed at every part of the airport and also having to register your phone number is a dumb idea, sorry to say. As you can see how many flights were delayed including mine! At least its better than being cancelled. A poor first impression with this airline. There was another flight heading to Jakarta but it was delayed even longer than my flight. I feel for those poor passengers, hopefully they managed to change their flight. Despite the delay, there was no meal voucher or apology from the airline. It was very disappointing. I walked around to explore the air side before ending up at a lounge. Unfortunately I couldn't take any photos because the lounge was too crowded. Instead, I grabbed some bite then left the lounge. Not long after, I heard an announcement about my flight, it was to be further delayed to 2000 hours, I wasn't pleased to hear that at all. There was no further news about the reason for the delay and I didn't want to go back to Jakarta too late so I went to the airline ticket office below who explained to me that the air plane was stuck at an airport due to a runway issue, its unbelievable if you ask me. I was directed to the check-in counter and the nice staff offered to change my flight to an earlier one. I had to explain to the staff that I wanted to fly the Boeing 737-500 and asked whether the earlier flight was operated by this type. It took him a while before he finally got it, but the female staff were looking at me blankly! I explained to him anyway my purpose and he finally understood it. He told me that the earlier flight was operated by 737-300 and my delayed flight was indeed a -500 so I decided to stick put to it. This was what I was here for, the -500! After that, I went to the coffee bean and relaxed until an hour before departure. I am pretty sure there weren't many other happy passengers like myself. A decent looking boarding pass - I wish I could keep the whole portion. There weren't many passengers at this point but it turned out to be quite full with only a few vacant seats at the rear. Glad to have gotten an ex-continental 737-500 with winglets! Finally, I was on board the aircraft. The window seat view was great, so no complaints at all. 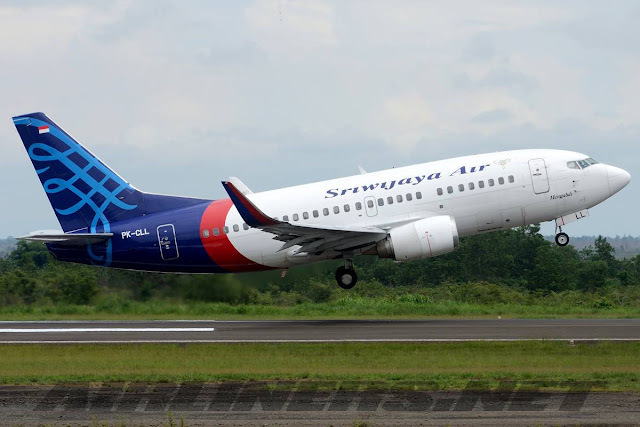 Sky Aviation's SSJ was my target, unfortunately the airline stopped operation and that means no more SSJ aircraft to enjoy in Indonesia. Sad for us, aviation enthusiasts. Websites on these airlines in Indonesia are not updated, so check first before you book, especially if you are flying for the aircraft type. Once on board, I sat beside 2 ladies; one was Chinese and the other was a local. The local elderly lady spoke no English and she said something to me after I filmed the take-off. I presumed she didn't like what I was doing. What shocked me was the passenger in front had her Ipad on her lap from the push back to take off. Not only that, the elderly lady beside me had her handbag on the tray. The crew didn't bother doing the take-off checks. As far I knew, they disappeared to their seats once the safety demonstration of the was done. The crew on my flight weren't friendly. That was bad enough especially when we had to wait for 3 hours. Perhaps they too wanted to go home asap and their mood was spoilt by the delay. Still, you should made it up by the service. I wasn't impressed at all especially with one of the female crew's attitude towards the passengers had a lot to be desired. We took off at runway 10 and made our 1 hr 10 minutes journey to Jakarta. Once the seat belt sign was distinguished, I decided to head to the toilet and take some cabin shots. When I was near the rear, I noticed a row of empty seat at the back, I asked the female crew whether I could move there, she was cool about it so I took my things from the overhead locker and shifted there. The elderly lady was already sitting at my seat, so it was a win-win situation for both of us. I guess she might have wanted that seat in the first place. While at the rear, I took some photos of the cabin, got some weird reaction from the crew and the off-duty crew sitting a row in front of me. That sums up my experience with this airline. Fortunately, no one stopped me from taking photos. Cabin view from the back, notice how short the length of the plane is! Luckily, there is an empty row at the back, I got the whole row for myself! The seat was comfortable despite the lack of legroom space, condition of the cabin was a bit worn off but nothing too bad. At least the cabin was in clean condition and that matters! Toilet is in good condition, no issues at all. Later on during the flight, all of us received a snack bag containing bread with lotus paste and a cup of water. The flight crew did apologize for the delay, but the cabin crew didn't look interested in their job. The airline's slogan - Your flying partner doesn't lived up to expectation. I was so far underwhelmed by the service. Not the worst but certainly not good. For the rest of the flight did come around to check that the rubbish was cleared and at least this time they did prepare the cabin for arrival, not sure whether it was just the front crew who failed to check our section before take-off. Parking at the remote lot allowed me to take this photo of this beauty. Unfortunately I wasn't allowed to take any more photos! The pilot who was flying this 737 made a very hard landing as you can see in my video! Horrible! Luckily, nothing else happened. We landed at runway 25R and taxied to the remote parking lot near terminal 1. From there, I exited the aircraft from the rear and made my way to the terminal, collecting my luggage before heading to the hotel for the night. Despite the delay and bad service, I was just glad that I finally managed to get this aircraft type off my list. I am not a fan of the 737, disliking the -300 and -400 for some reasons but the -500 is quite a comfortable aircraft to fly on and would be more than glad to fly on it in the near future. In fact, I would be flying on it with Kal Star (PKN-CGK), you can click here for the trip report. For international standard, this airline has failed in many aspects. Yes, the air ticket is fairly cheap but that doesn't mean you can take the passengers for granted. Since competition is aggressive, this airline at least on my flight should have handled it better. Of course there are much worse scenarios but if you are going to attract passengers, you would want to handle delays like this better. What the airline could have done was to offer vouchers, a clear explanation of the delay and an offer to transfer passengers to the earlier flights if they are in a hurry. As for the in-flight service, it all depends on your luck. Sometimes you meet good crew, sometimes you don't. I won't say this batch is the worst, but a few of them could have at least show that they enjoy their job. Smiles on their faces would definitely brighten up the gloom on some of the passengers' faces. Would I recommend this airline? Well, safety record wise, it seems aright. Don't expect much from the cabin or the service though, but its an option for you to get from one point to another. For now, Batik Air, Citilink and Garuda are ahead of this airline. Thanks for reading my trip report on Sriwijaya, my 54th airline!